The BCCLA and many other human rights and refugee groups have long advocated for independent oversight for Canada Border Services Agency (CBSA). 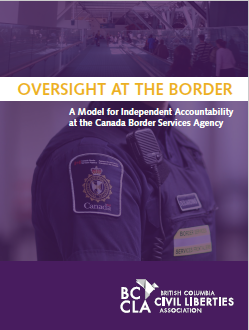 In this report, we propose a specific model for providing independent oversight and accountability to CBSA, and make detailed recommendations regarding the components necessary to ensure effective, credible oversight and review of CBSA’s activities. CBSA has vast policing powers, including powers of arrest, detention, and search and seizure. CBSA officers can stop travellers for questioning, take breath and blood samples, and search, detain and arrest non-citizens without a warrant. Yet despite these sweeping police powers, there is no independent civilian body to receive complaints, review CBSA’s policies or officer conduct, or investigate allegations of misconduct. There is no independent investigation of potential criminal wrongdoing or negligence when someone is harmed or dies while in CBSA custody. There is no independent body with a mandate to look at the agency’s policies and practices to ensure they respect the rights of the refugees, migrants, and Canadians officers interact with every day. This is a highly unusual situation in Canada. Every significant police agency in the country has some form of independent oversight or review body, and in many cases, multiple such agencies. In light of a worrying number of deaths of migrants in detention, deplorable conditions of prolonged confinement in immigration detention facilities, and numerous examples of egregious officer conduct, this glaring gap in oversight must be urgently remedied. After the deaths of two migrants in CBSA custody within the span of one week last year, and in light of sustained advocacy from human rights and refugee groups, Minister of Public Safety Ralph Goodale committed to creating an independent accountability mechanism for the CBSA as part of the government’s reforms to the country’s national security framework. We encourage decision-makers to consider the analysis and recommendations contained in this report when creating independent oversight for CBSA and debating the government’s proposal. The BCCLA is grateful to our partners at the Canadian Association of Refugee Lawyers (CARL) and the Canadian Council for Refugees (CCR), and all the advocates and individuals we met with for their support, and to the Law Foundation of British Columbia for funding this project.